3FUNCTION IN ONE. PRICE INCLUDES THE TABLE AND 4 CHAIRS. OCTAGONAL SIZE DINING TABLE 52 FROM POINT TO POINT. (48 FROM STRAIGHT ACROSS). 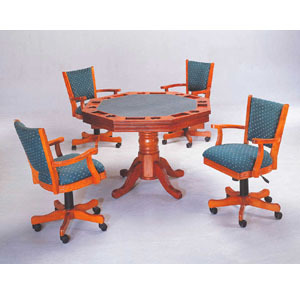 HEIGH OF THE TABLE:30 1/2.POKER TABLE BASE IS SOLID WOOD, REMOVABLE DINING/POKER TABLE TOP IS VENEER. 2 BXS PACK. CAST CHAIR WITH PNEUMATIC LIFT & TILT- BACK 25 1/4 X25 X371/2H 1 PC PACK.